SBI Small Cap Fund: Top Performer Reopens for SIP Investment! SBI Small Cap is now open for new subscriptions. Learn why is it a good time to invest in it. SBI Small Cap Fund, previously called as SBI Small & Midcap Fund is now reopened, thus introduced fresh subscriptions through investments via Systematic Investment Plan (SIP) from May 16, 2018. It was closed for new investments in October 2015 due to rising inflows and lack of investment opportunities. This period of halt led the mutual fund to restrict the inflows of fresh investments. Further, to prevent history from repeating itself, it has inserted an investment cap at Rs 25000, thus keeping it as the maximum value for any SIP investment on a single PAN. Let’s find out all about this top performing small cap fund and learn will it be a right decision for you to invest in it or not. Since inception, the scheme has managed to outperform its benchmark five out of seven times. The exceptional performance that it has delivered in the last one year has rewarded it with a five-star rating within the small-cap category. It flexibly roves across small and mid-cap segments, thus unearthing its bottom-up stock picking approach. He generally operates on a blend of growth and value investing approach and evaluates the companies for investment on relative ratings of the above-listed variables. Considering its past performance, the fund has assets under management amounting to Rs. 943 crore which is very well managed by Mr. R. Srinivasan. Without a shadow of a doubt, it is one of the best performing small-cap funds. Speaking of performance, the past one year and three-year returns of the scheme are quite substantial, which were 34.05% and 27.25%, respectively. The numbers are much higher as compared to its benchmark which rest in 26.35%(one year) and 15.96%(three years), respectively. What Changes Could Be Seen in the Scheme’s Investment Strategy? After the imposition of SEBI’s new rules for rationalization of mutual fund schemes, this scheme of SBI Mutual Fund will now fall in the small-cap category. The erstwhile SBI Small & Midcap Fund had emerged from the acquisition of the Daiwa Industry Leaders Fund by SBI in November 2013. Thus, following the new regulations, the scheme could buy the stocks beyond 251st stock in terms of market capitalization. Earlier, as per the scheme’s definition, the stocks beyond 401st stock were categorized as small-cap stocks. So, the new categorization gives fund managers 150 more stocks to select from. This will, therefore, provide a lucrative opportunity to the aggressive investors looking for making investments in small-cap mutual funds. 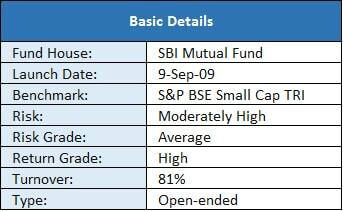 Keeping in mind all the above-listed points, SBI Small Cap Fund is an excellent option to invest in. If you’ve made your mind to invest your money in this scheme, you can do so with our investment platform. In case you wish to seek guidance on the same considering your own investment portfolio, connect with our experts at MySIPonline. You can easily do so just by making a phone call or writing us an email as we are ever-ready to serve you with all our might.